Yesterday posts from eMarketer and Marketing Pilgrim called my attention to some interesting social media statistics put out by advertising network Chitika. 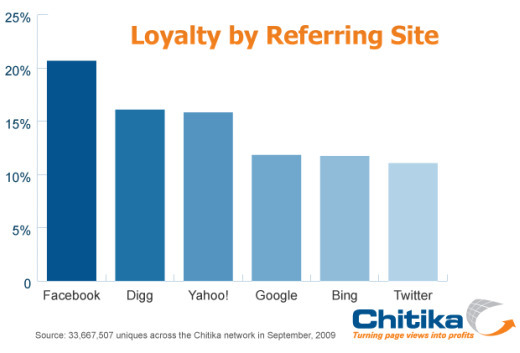 Facebook leading the pack isn’t much of a surprise since a high percentage of search engine referral traffic is “one and done” – searchers find what they were looking for and then move on. But I wouldn’t have expected Digg to be a strong second, since the social news site is known for sending large spikes of visitors that quickly scan the page and then move on. This highlights the fact that there is more to SEO than just increasing search engine referral traffic; it is essential to convert those visitors once they arrive. In publishing that typically means additional page views and time on site, RSS and e-mail newsletter subscriptions, user account and on-site community sign-ups, etc. 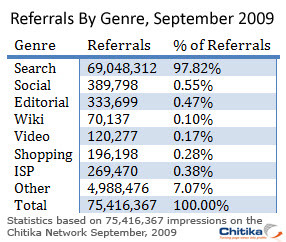 I’d also like to point out that for major media sites search engine referral traffic is typically a much smaller percentage than Chitika’s network is receiving. 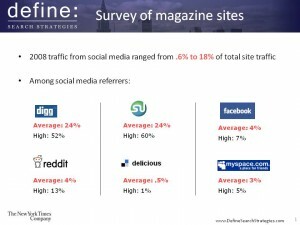 According to a Hitwise US News & Media Report back in 2007 on average search engine referrals represent about 23% of traffic to print media sites. (Side note: Hitwise, you’re overdue for an updated version of that report!). That’s a pretty good figure considering that direct navigation still represents the lion’s share of traffic to newspaper and magazine sites. For many news sites (especially poorly optimized ones) search engine referrals are still considerably below 20% of total traffic. As for social media traffic, while still quite small those figures are definitely trending up strongly for news and content sites especially when looked at year-over-year. Even just a year ago the majority of news sites were barely dabbling with things like Twitter – now most have Twitter mania. 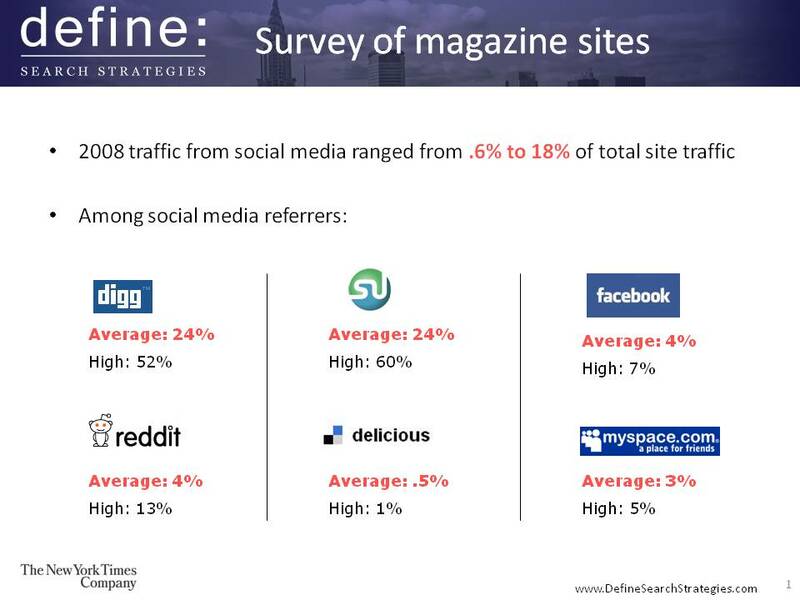 And while the figures for specific social media sites vary from site to site, total social media referral traffic is up considerably in 2009 to-date.